I love this infographics! Really do 🙂 I knew about the tea, that it was introduced by a Portuguese queen – fancy that??? 😀 And I’m learning some slang as well, only 4 years later. 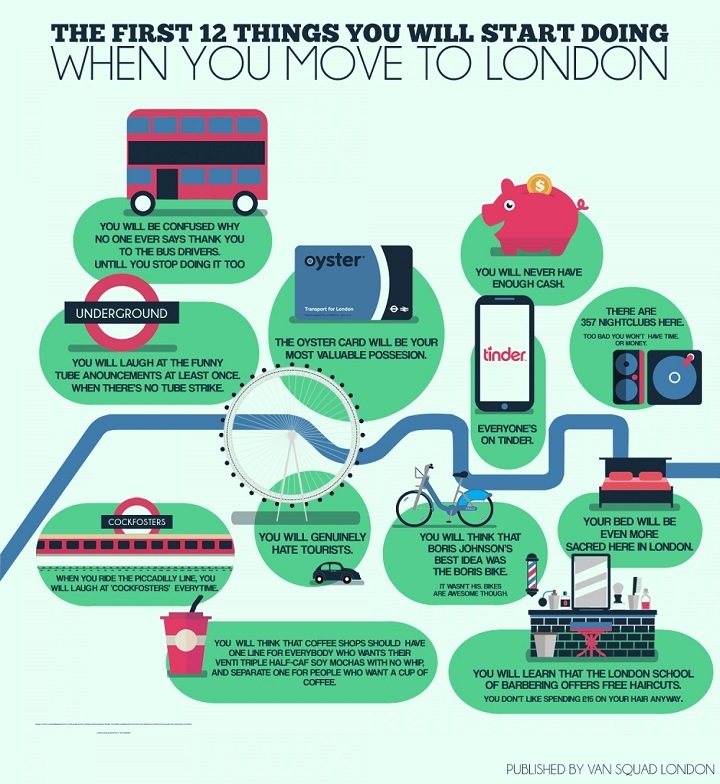 The one of things you’ll do once you move to London, so true. I still laugh in the picadilly line and I use this line frequently. These are brill! I’m hankering for a cuppa now. Haha I love these! I’m actually from London and I didn’t know things like the mosquito info! But the English words aren’t really correct, we call a scarf a scarf too – amongst others words that aren’t right! These are such fun facts!!! Thank you for posting these! Will keep in mind for future trips to London! Uau! The amount of stuff that I just learnt in a few seconds it’s awesome! These graphics are brilliant! And this makes me miss London. Hahaha. Love these Infographics. really entertaining to read. Who would have though more accidents were caused by grapes on the underground than banana skins. Thanks for posting. It brightened my day. Great stuff! I am heading to London for the first time in March, so this was all fascinating info for me. Thanks for sharing. Lot of love for these infographics! The facts about 40 min underground being the equivalent of 2 cigarettes is slightly worrying though! I spend two hours underground everyday to get to and home from work! Absolutely loved these and shared them with my friends! I especially love the 4th one, Londoner’s Guide to London. Thanks for sharing! I think I love these a little more than I should do! HERE IS A LIST OF WHAT YOU GOT WRONG! Again; only use knackered if you are really tired normally we just say tired – Tired! NOBODY SAYS ZONKED!!! We just say we are tired like you do! (by the looks of it). NOBODY SAYS BEEB EITHER!!! We just say BBC like you! NOBODY SAYS DOSH!!! WOW!!! We say money like you do!